Based on the reflection in the table, it is clear a watch on Patriarch Kirill's wrist was photoshopped out of the image. The Russian Orthodox Church issued an official apology for digitally removing a luxury watch from an image of Patriarch Kirill. He was pictured in a meeting with Russian Justice Minister Alexander Konovalov. The original photo, dated July 3, 2009, showed Kirill, 65, wearing the expensive watch, according to the BBC. In the edited version, which appeared this month, the Patriarch is seen without the watch. The deception might have gone unnoticed if not for one slight oversight: the reflection of the watch in the polished, shiny tabletop. The attempt didn't fool bloggers, who latched on, prompting the church to issue an official apology. 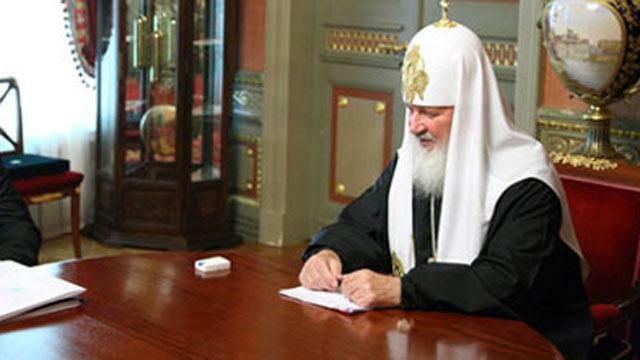 The original image of Patriarch Kirill, released in July 2009, showing a watch that was later photoshopped out of the image. "There will be a thorough investigation to determine why in this instance there was a crude violation of our internal ethical code," the patriarch's press team said in a statement. "The guilty ones will be punished severely." The watch was a gold Breguet, with an estimated value of more than $30,000, the BBC reported. The patriarch's press service responded, saying, "The person simply showed stupid initiative, not justified by anything and not agreed with superiors. It is clear that it is a mistake. We do not want to hide anything, we have nothing to be ashamed of," according to the Moscow News. The Moscow News also said that Vsevolod Chaplin, the church's head spokesman, told the Russian blog Slon.ru, "I do not care what watch he has; moreover, I do not remember what watch I have on my wrist, I would have to look. I am not interested in this side of life."